If you are passionate about any of these two artists you are in luck. 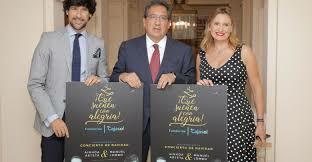 Repeating after the resounding success of last year returns to Seville on December 11. For the price of € 42 (plus expenses) you can enjoy the music of these two stars. The chosen place will be the Cartuja Center CITE, a very accessible place from the Hotel Adriano. The Hotel Adriano is a luxury within reach of anyone. The details they offer exceed expectations. If you are thinking of coming to Seville and attending the concert, stay with us.